In this strategic project of the Bjerknes Centre for Climate Research, we aim to better understand and quantify rates of ice sheet change. Ice sheets are an essential and vulnerable component of the climate system. They respond to climate forcing through interaction with the atmosphere and ocean, often modulated by basal hydrology and topography. In turn, ice sheets affect atmospheric circulation through changes in surface topography and albedo, and ocean circulation through meltwater runoff. Fluctuations in ice sheet volume directly impact global and local sea levels. Ice loss from the Greenland and Antarctic ice sheets is rapidly increasing. Yet, predictions of future contribution of ice sheets to sea level rise are uncertain as we still have an insufficient understanding of the processes that determine short- and long-term rates of ice sheet disintegration. With RISES we will specifically address the effect of atmospheric blocking patterns and (related) changes in basal drainage system below the ice on the mass balance of the Greenland Ice Sheet. 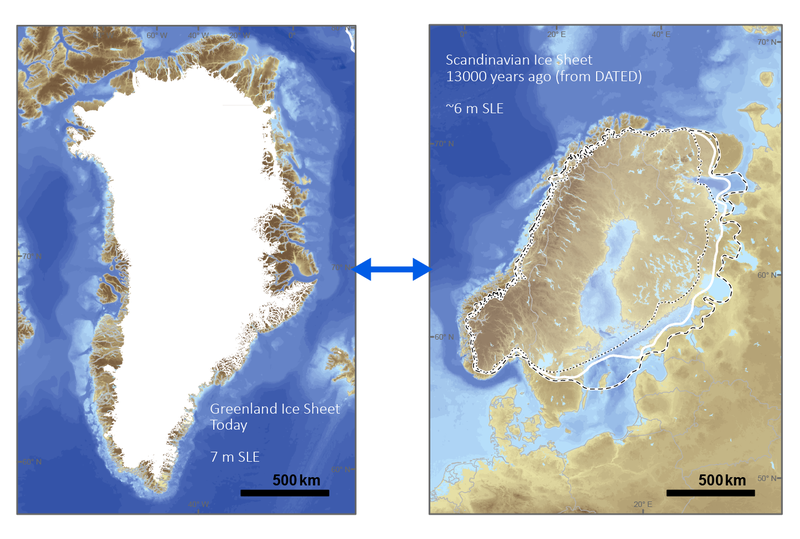 We will also study the retreat of the Scandinavian Ice Sheet during the last deglaciation, and use this knowledge as an analogue for likely future retreat of the Greenland Ice Sheet.